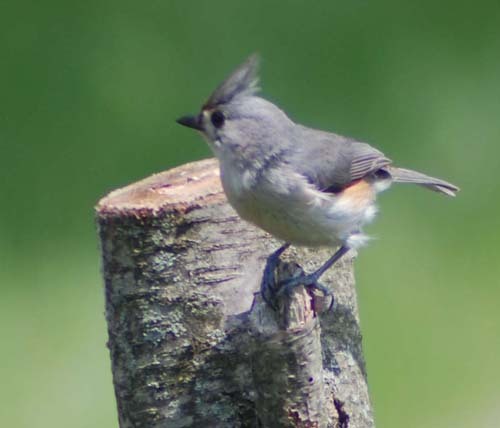 Tufted titmice are year-round residents in our yard, preferring nestboxes by the creek area or in overgrown fencerows. They often choose the boxes with slabwood fronts (retaining the bark). However, titmice have used the conventional painted wood bluebird box in the busiest part of our yard on two recent occasions. 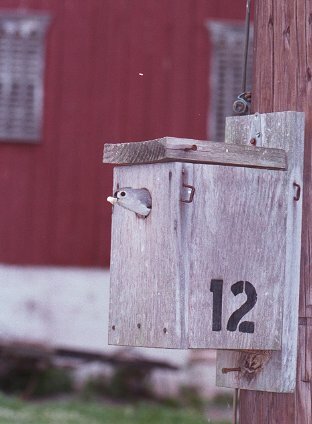 Feb 2011 update Tufted titmice have attempted to nest in a nestbox with video camera hanging in a maple tree for the past two years. A house wren has punctured their first egg in both years, causing them to desert the nest. The wrens moved to a gourd placed in a nearby tree, but, still did not allow the timice to nest in the box. Our backyard bluebirds, on the other hand, have successfully reared multiple broods each year, even though their box is even closer to the wren gourd. The bluebirds practice continual vigilence and don't allow the wrens within 10 feet or so of their box. On several occasions, I have witnessed one of the bluebirds dive at a house wren that has landed on the roof of the trailer blind, 8 feet from the bluebird box. Other songbirds are never challenged unless they land on top of the bluebird box. During their nesting attempts, the tufted titmice often flew off together, leaving their nest box unattended. All the male house sparrow needs is a few seconds to commit his treachery.